Standard - $44.99 X-Large - $44.99 Only 7 left! Imagine that it is the 1980s and you have to choose what sort of hero you plan on being. Ha! Like you have to imagine it is the 1980s. If you were part of them, you live them. And if you live them, you still can’t get over the Teenage Mutant Ninja Turtles. So, you’ve no doubt undergone several years of training for this very purpose. It is time to done the colors, grab your weapons, and fight off the Foot Clan! So, the next question is to figure out which color that is going to be! Of course, it is tough trying to be a fulltime ninja when you’ve got work and all those other adultish things to deal with. So many people telling you what and how to do everything. Ugh! Now that we think of it, it is obvious which Turtle is perfect for you! Raphael! Without him, how would anything get done? Aggressive and ready to knock some skulls together whenever the Foot Clan are ready to cause problems, you can trust that Raphael is going to be in the front line with his sai blades! 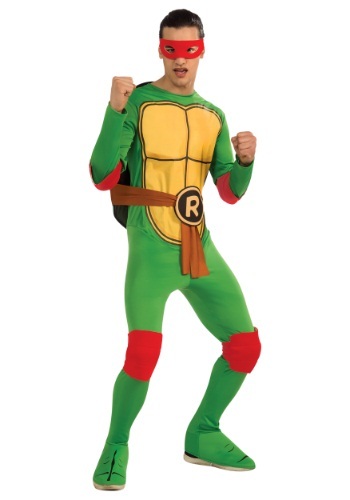 Get into gear and take on the clan with this Classic Adult TMNT Rapheal costume. The officially licensed polyester stretch jumpsuit is comfortable and has Velcro in the back to attach the foam-backed shell which can be stuffed for a profound 3D effect! The yellow and muscled shell is printed on the front and foam foot covers keep the illusion alive. Knee and elbow pads fit with elastic straps and feature the bright red matching colorization. Go Turtles!